The clinic runs eight consulting rooms, including specialist Paediatric and Keratoconus rooms. 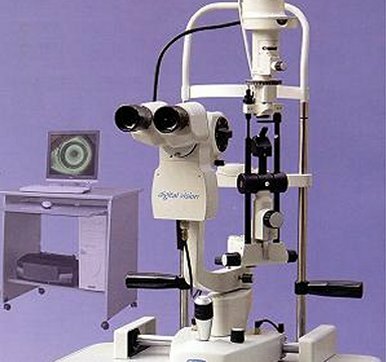 The range of consulting room equipment regularly found in private optometric practices is augmented by cutting edge equipment not normally available. Images, plots and other data from diagnostic equipment are stored digitally. Wireless networked touch-screen notebook computers in each consulting room equiped with Sunix Vision practice management software link to this repository enabling a totally digital practice record system. This Optos Optomap is the clinic's latest addition, a digital imaging device that performs an ultra-wide digital retinal scan capturing more than 80% of the retina in one panoramic image. The photographs are used for comparison and documentation of changes caused by conditions such as macula degeneration, vascular hypertension, and diabetes, and degeneration in the peripheral retinal areas that are more difficult to view by other methods. The scan can often be performed without the need to use pupil dilating drops. 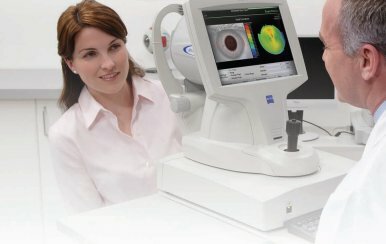 The clinic's Cirrus HD-OCT from Carl Zeiss Meditec is a new optical coherence tomographer that employs a non-invasive laser scanning technique to obtain a topographical view of the retina (the light receptive layer at the back of the eye) with histologic quality. An OCT scan can monitor changes in macula degeneration, macula hole, and the nerve fibre layer that is effected in conditions such as glaucoma. This Carl Zeiss Meditec non-mydriatic Fundus Camera is a specialised low power microscope with an attached digital camera designed to photograph the interior surface of the eye, including the retina, optic disc and macula often without the need for drops to dilate the pupil. The photographs are used for comparison and documentation of changes caused by conditions such as macula degeneration and diabetes. The Carl Zeiss Meditec Atlas Corneal Topographer is a non-invasive imaging device that maps the surface curvature of the cornea, the clear front surface of the eye. The patient sits facing a bowl containing an illuminated pattern of concentric rings. This pattern is focused on the patient's cornea and reflected back to a digital camera at the centre of the bowl. Computer analysis of the reflected pattern produces a topograhic map of the cornea. The cornea is responsible for nearly three quarters of the eye's focusing power so its surface shaping is critical in determining vision quality. The three-dimensional map the topographer produces assists in contact lens fitting and with the diagnosis of a number of corneal conditions. 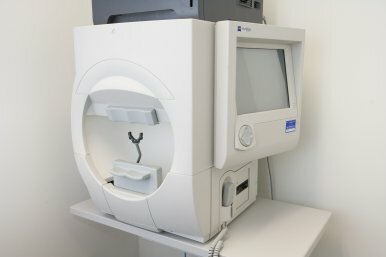 The Humphrey Field Analyzer is a wheelchair accessible, computerized perimeter used to examine the patient's visual field. 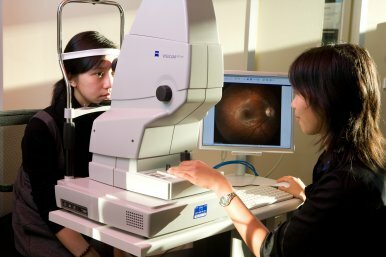 Visual field testing is important in the screening, diagnosis, and monitoring of various eye, optic nerve and brain disorders. Whilst sitting in front of the concave dome and staring at a central target within the dome a computer-driven program flashes small lights at different locations within the dome's surface. A button is pressed when the small lights are detected by the peripheral vision. Responses are compared to age-matched normal field responses to determine the presence of defects within the visual field. A patented aspherically shaped bowl provides a compact, ergonomic design to increase patient comfort while testing out to 90°. 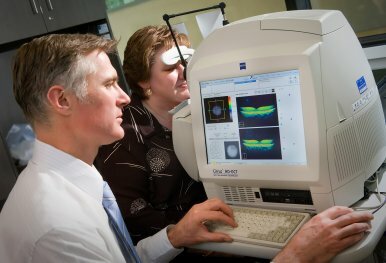 The unit combines Blue-Yellow testing, allowing earlier detection of visual field loss resulting from glaucoma, and the traditional white-on-white method. There is also a head tracking system that automatically repositions the patient's chin and head to keep the eye properly centered. Glaucoma is the second leading cause of blindness worldwide, causing a gradual loss of visual field over a long time and may only be recognized when it is already quite advanced. Once lost, this damaged visual field can never be recovered. The Matrix Perimeter utilizes Welch Allyn Frequency Doubling Technology to quickly and accurately detect the early stages of visual field loss associated with glaucoma, and other eye diseases. The Matrix Perimeter is primarily used as a screening device having a faster testing time than conventional perimeters, and does not require a darkened room or the non-tested eye to be patched. This instrument combines an auto refractor, keratometer and non contact tonometer in the one unit. 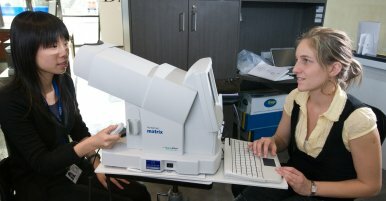 An auto refractor allows a quick objective measurement of a person's error of focus to be made. One eye at a time, the patient simply looks into the instrument at a picture inside. This picture moves in and out of focus as the instrument takes readings to determine when the image of the picture is positioned on the back of the eye. Several readings are taken by the instrument which averages them to form a prescription. This can provide a starting point for subjective testing using the changing of lenses and the patient's feedback whilst looking at a chart. In keratometer mode the instrument gives a measurement of the curvature of the front surface of the eye, the cornea. The reflection of a ring shone on to the cornea is analysed to give a reading for the curvature over the central few millimeters. This compares with the thousands of points over the entire corneal surface used by the more sophisticated Atlas Corneal Topographer. The keratometer reading has however been a valuable measurement for astigmatism assessment and contact lens fitting for decades. Thirdly, the instrument offers an air puff non-contact tonometer. Tonometry is the measuremant of the internal pressure of the front chamber of the eye, the importance of this being that there is a condition - Glaucoma - where this pressure is too high. Historically the most accurate applanation tonometers pressed on a small area of the cornea with a probe, requiring the prior instillation of anaestheic drops to the eye. The non-contact tonometer uses an optical sensor to determine the force of the air puff required to flatten a small central area of the cornea. As this process does not cause any contact with the eye no drops are required. Technological advances have meant that this non-contact tonometer can give readings that correlate well with those produced using traditional applanation tonometry. 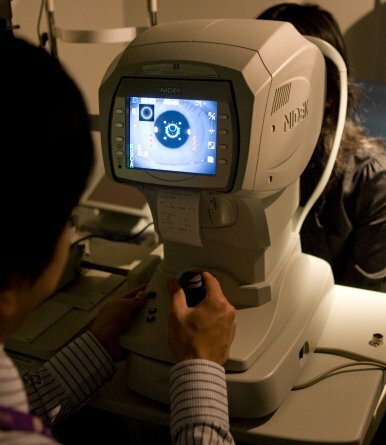 An Auto Refractor Head is a convenient and comfortable means of presenting lenses and conducting tests of a patients vision as an alternative to using a trial frame. This auto-refractor takes the next step by using a controller to change settings on the motorised refractor, this controller doubling as a touch-screen enabled near vision test display. The DFV Digital Photography Slit Lamp is an instrument that combines a high-intensity light source, that can be focused and shone as a slit of light with a binocular microscope. This enables the stereoscopic magnified examination of the frontal structures of the eye, and when used with special lenses, the anterior angle structures and fundus. The addition of the Digital Vision System comprising a digital camera with a Sony CCD sensor allows the acquisition of high-quality pictures and videos of the eye's anterior segment and fundus. The Vistavision Computerised Chart combines traditional letter targets with charts checking colour vision, stereo vison ability and contrast sensitivity. Charts are displayed on a high resolution and performance 19" LCD screen that is silent and has a precise brightness. The dispensing area boasts a Rodenstock ImpressionIST (integrated service terminal). This has the ability to capture an image of the patient and demonstrate their appearance with various eyewear options and provide a print-out. A two-camera 3D video centration system takes measurements to specify a customised progressive lens available from Rodenstock. 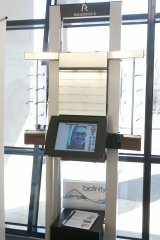 There is an interactive product information facility and a software system allowing the comparison of the thickness and weight of various lenses with spectacle frame options. An on-line ordering capability streamlines service delivery.